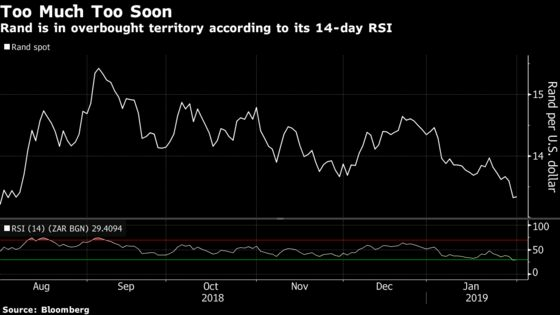 (Bloomberg) -- The rand has been the biggest beneficiary of Federal Reserve Chairman Jerome Powell’s gift to emerging markets, but one technical indicator suggests the South African currency’s surge is overdone. The dollar’s 14-day relative strength indicator versus the rand dipped below 30 on Thursday for the first time in a year, a sign to some traders that the greenback has dropped too far, too fast against its South African counterpart. The South African currency has strengthened 7.4 percent against the dollar in January, spurred by a more dovish Federal Reserve. That gain is not only its best start to a year since Bloomberg started tracking the data in 1998, it also makes the rand the top-performing currency in the world this month. Though the general risk environment has improved, factors that weighed on emerging-market assets in recent months, including the U.S.-China trade war, haven’t gone away, said Nema Ramkhelawan-Bhana, a Johannesburg-based analyst at FirstRand Bank Ltd. The rand gained 0.3 percent to 13.3846 per dollar by 1:40 p.m. in Johannesburg after advancing 2 percent on Wednesday.